Four pyxides and an oinochoe. "Perhaps North-Eastern Greek, late 8th-7th centuries BC". Previous publication: Glories no. 80 (part). Griffin protome. "From Olympia, perhaps near the River Alpheios (according to Jantzen)". Previous collections: von Streit (Athens); J. Scharpf (Münchenstein); M. Schuster (Lausanne). Previous publication: Glories no. 81; first published in 1955. Seated lion. "Laconian, early sixth century BC". Previous publication: Glories no. 84. Recumbant lion. "Perhaps Laconian, early to mid sixth century BC". Previous publication: C.M. Stibbe, The sons of Hephaistos (Rome 1998) 115-21, fig. 73. Hermes. "Perhaps Laconian, mid-sixth century BC". Previous publication: C.M. Stibbe, The sons of Hephaistos (Rome 1998) 652, no. 43. Athlete wearing perizoma. "Western Greek, mid-sixth century BC". Unpublished. Trefoil oinochoe. "Northern Greek or Macedonian, probably second quarter of the fourth century BC". Previous publication: Glories no. 96. Hydria. Relief of Orpheus and a satyr under handle. "Mid-fourth century BC". "Perfectly preserved"; "the preservation ... suggests that its final context was the grave". Unpublished. Calyx-krater. "Perhaps Attic, second quarter of the fourth century BC". Previous reference: B. Barr-Sharrar, in Alexander the Great. From Macedonia to the Oikoumene (1998) 98 n. 4. Dionysiac mask. "First century BC-first century AD". Unpublished. The armlet, pyxides, and oinochoe once formed part of a much larger hoard, comprising forty bronze objects and one gold pectoral, known only from an old photograph. Von Bothmer places them firmly in northern Greece: "these primarily Macedonian objects". 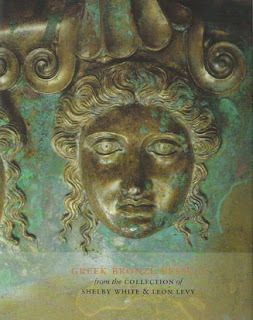 The new catalogue merely notes that such bronzes were "destined ultimately for the tomb where they were placed in large numbers"; the hint at Macedonia is given by the oinochoe for which the spout "is typical of oinochoai found in the Chalkidike". And how old is the photograph? Who took it? Who supplied it? Traces of fabric in the patina on one side of the body ... indicate that this vessel was wrapped at the time of burial, suggesting that its final (if not original) use was funerary. Where was this burial? Macedonia seems a possible candidate. Not included here is the "bronze volute krater", similar to the one from Trebenishte (in the Republic of Macedonia), now on loan from Shelby White to the Houston Museum of Fine Arts (MFAH). The curatorial staff at MFAH tell me that the volute-krater was "included ... as a part of the exhibition of bronzes from the Shelby White and Leon Levy Collection" (e-mail of February 8, 2008). Why did it fail to make it into the catalogue? Indeed, it also failed to appear in the catalogue for The Centaur's Smile: The Human Animal in Early Greek Art at Princeton University Art Museum (October 11, 2003 - January 18, 2004). No. Because Frances Marzio of MFAH has told us: "it’s not as though she [sc. Shelby White] is hiding anything." Bothmer, D. von (ed.) 1990. Glories of the past: ancient art from the Shelby White and Leon Levy collection. New York: Metropolitan Museum of Art. Chi, J., and J. Gaunt. 2005. Greek bronze vessels from the collection of Shelby White & Leon Levy. Atlanta: Michael C. Carlos Museum, Emory University.